Hafod-Y-Bryn Boarding Kennels and Cattery in Colwyn Bay, North Wales have been caring for dogs and cats since 1982 and we are proud of our history and reputation. We care for pets across the whole region of North Wales and beyond including Colwyn Bay, Conwy, Llandudno, Abergele, & Rhyl. We are a family business who aims to create a loving and caring environment for your beloved pets whilst you are away from home, we are the ideal holiday home for your cats and dogs as we offer the rural setting but being only minutes from the A55. The kennels boasts three large Astro Turf areas for your dogs to run and play, with an additional option for walks, on either road or fields. In comparison to our lively kennels, the cattery remains a docile environment for your cats to relax, offering a window ledge with a view to the outside world. Both the cattery and the kennels have caring staff to cater to each animal’s individual needs and each owner’s preferences, to the best of their ability. Both the kennels and cattery accommodation and reception areas have undergone refurbishment works after the business changed hands in 2013. Now owned and run by Steve & Nicola Frost, the aim of the new owners is to be the premier venue for your dogs and cats in North Wales. 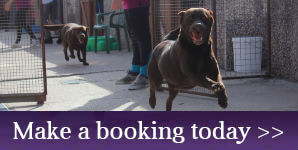 Whether you are going on holiday, moving home or just need somewhere for your pet to stay for a few nights, or just the day with our Doggy Day Care Scheme, we really can be the premier choice for you and your pets so contact us at Hafod-Y-Bryn today for more information. A deposit is now requried to secure your pets stay over the Christmas period. Please use the buttons below to secure your place today.